George Groves outpointed France's Christopher Rebrasse at Wembley Arena to win the European super-middleweight title. Groves, 26, controlled the fight and won a unanimous decision to earn a shot at WBC champion Anthony Dirrell. Rebrasse landed some powerful punches of his own, but Groves's strong start and superior work-rate earned him a convincing victory. Two judges scored the fight 118-110, with another making it 117-111. 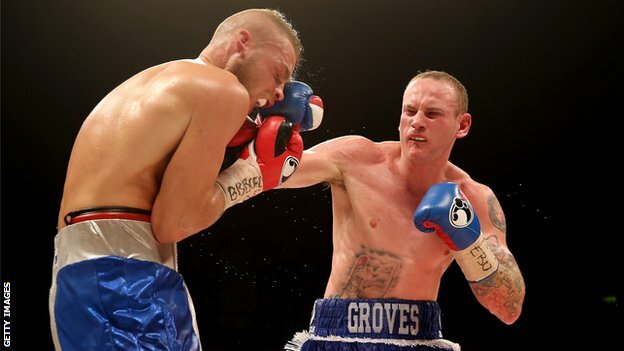 "It feels great," said Groves, who improved his record to 20 wins from 22 fights. "That was a tough fight and the crowd helped me come through. "Rebrasse was a good opponent, a tough guy - he took an awful lot of punches. "It's onwards and upwards. I want to take over the world." After the fight, Groves called out ringside television pundit Carl Froch, who won their two high-profile and acrimonious world title bouts. "I'd love another shot," Groves told Froch, who dismissed any prospect of a rematch. In his first fight since being knocked out by Froch at Wembley in May, Groves began strongly and dominated the opening round. Rebrasse rallied well in a much more even second, but left himself open in the third, allowing the Briton to rock him with a powerful flurry. Groves continued to operate at a remarkable tempo in the fourth, with his powerful and persistent left jab preventing the taller Frenchman from exploiting his reach advantage. Rebrasse improved in the quieter middle rounds, catching Groves with some powerful punches on the counter, but they were isolated moments of success and the reigning champion was having little joy behind his own jab. The eighth round encapsulated the competitive nature of the fight as Groves caught Rebrasse on the ropes, although the Frenchman unleashed some hurtful shots of his own. While Rebrasse was showing the durability of a man who had never been stopped, Groves's superior hand speed was telling and he caught his opponent with a series of stinging right hands at the start of the 10th. The final rounds were even, yet Groves had comfortably done enough to set up another world title fight against unbeaten American Dirrell.